All kids aim to be more grown up, as it’s only when they cross the 20 year barrier they start getting excited about being ID’d again. Well help your little ‘uns be just like mum and dad with a QWERTY device that trains the how to be teachers lawyers great spellers. 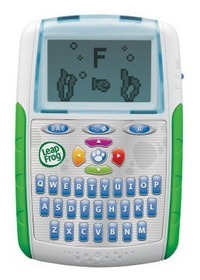 The Text & Learn is the latest child friendly device from Leapfrog, and features a variety of child like games. The colour screen will take you through spelling and word games and you can even create fake text messages to send, just like ma and pa! Of course the obvious lack of a SIM card and Wi-Fi connection should prove an obstacle, but hey, what does a five year old really need to say via text? Approx £15 later this year.